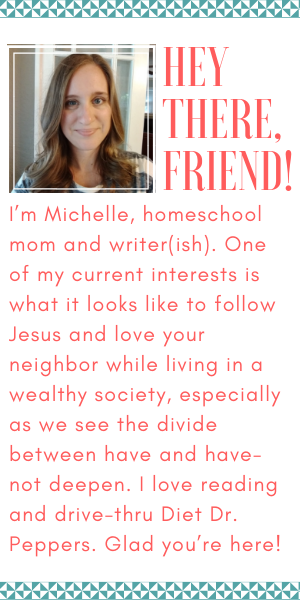 When I first researched and decided to homeschool, I figured it was a forever decision. In time, I saw the wisdom in taking that decision year by year, always asking if it’s still serving us well. And now, some days I’m just downright conflicted. We have good days but then we have really hard days. I worry about whether I can provide them x, y, or z–but then I wonder if school would miss a, b, or c. And some days, I just flat out want time and space away from my kids, because wouldn’t absence make our hearts grow fonder? There are enough confounding factors that I need something concrete, not the changing nature of my emotions, as a guiding principle. I need an education manifesto that spells out what I believe my kids need to learn so that I can measure any school options against a standard, not just my feelings. Over the next two weeks, I’ll be fleshing that out and putting all the links on this post. I may miss things or add things with time, but having some kind of foundation set in writing is a good start. Your turn: what’s most important to you when it comes to a child’s education?